"Me and my friends made this up during a party we gave about 10 or so years ago. We were drinking champagne and shooting gelatin shots. 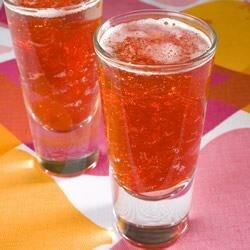 We chunked up a gelatin shot and added some to a glass of champagne. A few years later I mentioned this idea to some guests at the restaurant where I was bartending. About 3 months later a local bar was advertising these drinks." Pour champagne into glasses. Break up the gelatin with a fork, and pour into a glass of champagne. A little stir gives it some 'lava' action. Drink with caution, these will sneak up on you. Let the jello sit at rom temp for just a little bit. It will rise to the top better if it is not fresh from the fridge. GREAT party drink! i made the jello shots in large tupperware and diced it so they could easily be added to the champagne glasses. also went great with all other fruity drinks we made that night! Made for New Years and they were a hit. Definitely something different. I don't usually like jello shots, but I loved them with the champagne. Made 2 batches, strawberry and blackberry. Yum! These are great! I used cherry vodka and cherry jello. They were great for a retro party. All my guests wanted the recipe. Made these little treats for New Year's Eve, and watch out! They are wonderful, but will definitely sneak up on you! I have made them several times after, and everyone always loves them.